It's back to school time....otherwise known to Silhouette crafters as "Label All the Things with Vinyl" season. Given that it's Expressions Vinyl big Back to School sale I thought I'd take this show on the road. That's right - today I'm doing something I don't normally do...and that's taking over another blog! 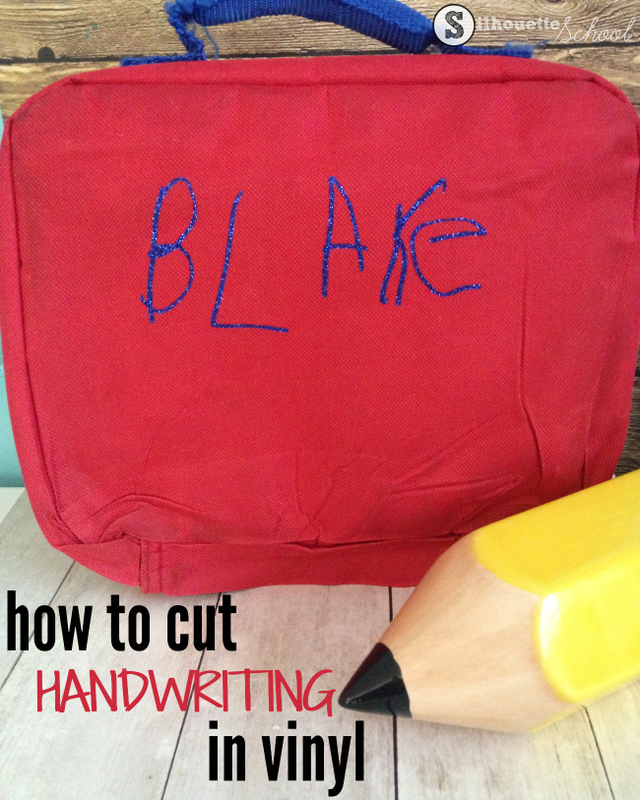 I am so excited to share this tutorial on cutting your child's own handwriting with a Silhouette CAMEO or Portrait machine over on Expressions Vinyl - so head on over there to learn my tips and tricks for easily tracing, cutting, and applying handwriting in HTV to a lunch box! only put your child's name in a visible spot if you are absolutely certain there are no pedophiles in your area! I am so gonna do this when my daughter is a bit older. Super cute! Cant wait to so this with my hubbies hand writing!! This was my blog posting for the contest. Didn't see how to do it on the list that was on your website. My sister is a teacher and wants to do this for their cubbies in her classroom! Thank you for the help on how to do this - I know many of parents & grandparents that would love me to do this for them. This is amazing! I can label my children's backpacks and lunches boxes! This is awesome! I wish something like this was available when my kids were young. I'll have to use it when I have grandkids.